DIVE LOCAL is a community effort to reach the general public and promote snorkeling and scuba diving as a exciting recreation. Our Mission is to show people how to; 1) Learn to Dive. 2) Buy Their Dive Gear. 3) Go Diving. 4) Stay Active in the Recreation. Our Goal is to support and promote; 1) Local Dive Stores. 2) Local Dive Operators. 3) Local Dive Clubs. 4) Local Diving Instructors. Chapter 1 – What is Local Diving? Chapter 2 – Four Pillars of the Local Dive Community. Chapter 3 – What is DIVE LOCAL? Chapter 4 – Levels of Participation. Chapter 5 – Geographical Breakdown of Local Diving. Chapter 6 – The Problems with the Industry. Chapter 7 – Possible Solutions. Chapter 8 – Actionable Items to Work on. CHAPTER 2 – FOUR PILLARS OF THE LOCAL DIVING COMMUNITY. The diving industry as a recreation is spearheaded by four sectors of the industry who come in contact with the general public on a daily basis; the Local Retail Dive Centers; the Local Dive Boat Operators; the Local Dive Clubs; and the Local Diving Instructors. Local Retail Dive Centers are the centers of activity in their Local Diving Community. As public businesses, they are usually the first point of contact between the general public and our industry. Hundreds of thousands of people in the United States learn to dive at dive stores every year. Dive Centers are where people learn to dive, buy their equipment, and if done correctly, stay active in the recreation. Dive Stores also rent equipment, have a fill station, repair and service equipment, have a club, book local dive charters and conduct annual dive vacations to dive destinations worldwide. A well-run retail dive center is a one-stop-shop for the recreational diver. Local Dive Boat Operators do their part in keeping divers actively diving. And they make money at it too! Dive Boats service the student divers and certified divers alike. Keeping Dive Operators in the public eye and publishing their individual schedules is a full time job. Promoting Dive Operators is a national industry priority. Local Dive Clubs were very popular in the 1950’s and 1960’s. Those were the days when being “Social” actually meant something. In the past 46 years Dive Clubs have performed a very important role in keeping divers active. Today, non-profit organizations like the Underwater Society of America are still bringing divers together by planning local events such as Underwater Hockey. If we want our recreation to survive, we need to return to the club concept and keep divers actively involved. Local Scuba Instructors teach in dive stores, high schools, colleges & universities, YMCA’s, resort destinations and independently. Is teaching scuba diving a hobby or a business? It could be either and it could be both. Many of our industry retailers, reps, manufacturers and travel professionals started out as scuba diving instructors. Getting access to a classroom, pool and open water is relatively easy and there are many ways to accomplish this. With the introduction of social media and modern marketing vehicles, advertising instructional services is easy and inexpensive. There is no reason why Scuba Instructors shouldn’t have a WordPress Blog Website, a Facebook Page and a Constant Contact email account to help them market their services to the general public. The only major challenge independent instructors still have is their access to reliable instructional equipment. DIVE LOCAL is a community effort to reach the general public and promote snorkeling and scuba diving as an exciting recreation. It is a combined industry effort of dive industry professionals to promote diving and stimulate diving activity within the diving community. DIVE LOCAL uses National Magazine coverage, Regional Dive Shows, and Regional Summit Conferences in addition to websites, newsletters, blogs, electronic mail, press releases, and social media networks to promote local diving shows & events and local diving activity. Our Mission is to show people how to: 1) Learn to Dive. 2) Buy their diving equipment. 3) Go Diving. 4) Stay active in the recreation. Our Goal is to get new customers in the doors of: 1) Local Dive Stores. 2) Local Dive Boats. 3) Local Dive Clubs. 4) Local Scuba Instructors. Think of DIVE LOCAL as a pot-luck dinner that everyone can participate in, but only works if everyone brings something to the table. For the community effort to be successful in the long-term, all of the participants need to gain something from their involvement. Ambassador: Any person that has a vested interest in the economic development of diving as a sport, recreation, profession, career, or hobby. Ambassadors come from Dive Retail Centers, Dive Boat Operators, Dive Clubs, Scuba Instructors, Employed or Volunteer Diver, or from any Service Related Business. Volunteer: Divers and non-divers alike. Anyone can donate time and/or talent to the campaign to promote local diving. Sponsor: Businesses that specialize in diving and watersports or who benefit from the economic impact of diving and diving related businesses have the duty and responsibility to help promote the community they rely on for a living. Sponsors receive a direct benefit and promotion from their generous donations. Sponsorships start at $5,000 per year and may be tax deductible. Check with your accounting professional. At least one sponsor is needed for every Trade Show we exhibit at. Donor: Any person or business entity may make a donation to the Dive Industry Foundation, in any amount. The Foundation is a non-profit, tax exempt, 501(c)3 charitable, educational organization. Donations are tax deductible and Donors can specify what their donations are to be spent on. The Foundation promotes local diving, conducts industry surveys, sponsors business seminars and luncheons, works with diving and diving related non-profits and has helped members of our community in times of personal need or disaster. Advertiser: There are plenty of advertising opportunities through the Dive Industry Foundation and Dive News Network’s Scuba & H2O Adventure Magazine. Media Kits are under construction and will be available in the near future. Friends of the Industry: Any person may become a “Friend of the Industry”, our partners in promoting local diving and doing good work for the industry. Annual Memberships are recognized for a donation of $25 or more. Common Geographical breakdown is by City, County, State, Region, Country and Continent. Example: Our office is in the city of West Melbourne, Brevard County, State of Florida, Southeast Region, United States, and North America. What we consider “Local” depends on the number of Divers and Diving Businesses in an area. Geographical Chapters should be formed based on ease of meeting and working on local events together. There is no recommended minimum number of people in a Chapter but the maximum number should not exceed much more than 100 people per Chapter. As your Local Chapter grows, we recommend you split the Chapter into smaller, easier to manage Chapters. Chapter designations should be very flexible and changed to meet your local needs. Scuba Diving Shows are the annual highlight event of every region. More people attend their Regional Trade Show than any other event in the year. That is why we chose to conduct three Regional Summit Conferences in the United States in 2016. Over 100 Dive Industry Professionals attended and participate. We took good notes and video taped major portions of the programs. Twelve Steps to Unifying the Recreational Diving Industry. In an effort to overcome the fragmentation of the recreational diving industry, we are suggesting 12 steps that help to unify it and help it grow. DIVE LOCAL has created a central place on the internet for all Divers worldwide to gather and get their information about all types of diving and adventure travel. The goal is to improve business opportunities in the recreational diving market for all businesses specializing in diving. Step 1 – Subscribe to our Blog at diveindustrynews.wordpress.com All Editorials, Articles, Press Releases, and Industry News start out as a blog post. Editor, Gene Muchanski blogs on important diving topics including; Monthly Editorials; Press releases from industry businesses; Equipment reports and reviews; Travel articles and resort destination reviews; Industry Surveys and their results; Industry current events; and Industry Intelligence. Step 5 – Participate in the International Diving Cooperative Program, DIVE LOCAL: DIVE LOCAL is a project of the Dive Industry Foundation, a non-profit, 501 (c) (3) tax-deductible, charitable organization. DIVE LOCAL is international in scope and one of its sponsors is the Dive Industry Association. DIVE LOCAL has a Blog Website, a Facebook Page and its own Twitter Account. The main goal of DIVE LOCAL is to create opportunities for local diving businesses and help them succeed in business, thereby growing the industry. Our first task is to define the size of the industry and its economical potential. To do that we must identify the dive businesses and dive industry professionals that make up the dive business community. To ensure that only current dive businesses are listed in our directories on https://divelocal.wordpress.com we are asking dive businesses to send us their current business card and any marketing materials they may have on their company. Anyone who comes in contact with a Dive Industry Professional can participate in this project. Manufacturers can send us a business card from each of their key employees and Reps as well as their product catalog, Dealer Price Sheet and any marketing materials they may have. Dive Retailers can get a business card from every Sales Rep who visits their store. Sales Reps can get a Business Card from every Dive Store they visit throughout the year or see at the DEMA Show or Regional Dive Show they attend. It would be very helpful if you put them in the mail to us on a monthly basis. Training Agencies come in contact with a tremendous number of Dive Industry Professionals and can and should be a big help in this project. The reason we ask for the original business cards is that we use Card Scan hardware and software to process and file the cards for our industry database, which is currently at about 4,400 Dive Businesses and Industry Professionals. But first, allow me to destroy some common myths and assumptions associated with this project and give you some guarantees that will make you feel more at ease. First of all, DIVE LOCAL will not share any sensitive content about your company to any individuals in the industry. In the case of dive companies, we only list the name of the company, it’s city, state and country and its website address on our Regional and Worldwide Directories. That is to give you exposure and promotion to potential customers, not to get you on everyone’s spam list. 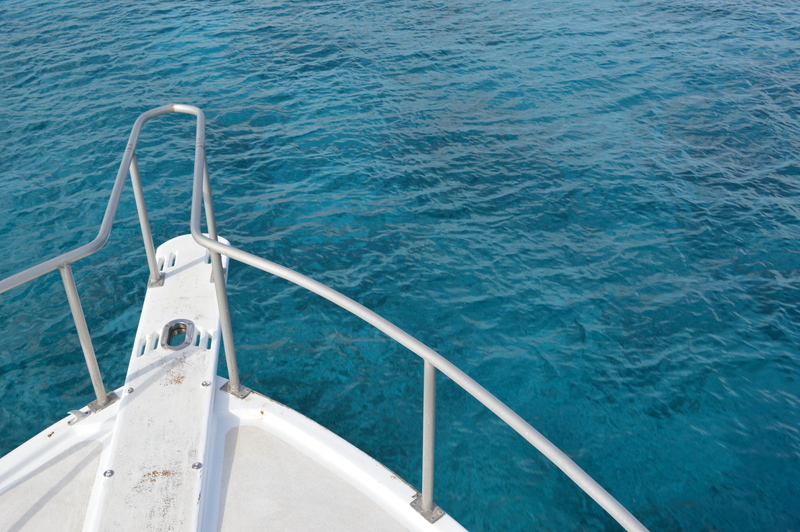 In the case of Dive Stores and Dive Boats, 99% of these businesses want people to visit their business website. That’s how you get customers. Dive Clubs and Dive Instructors may have different ideas on how they advertise for customers and that is on our “To Discuss” list. Secondly, we are listing dive businesses (Manufacturing, Retail, Training and Travel) that are registered businesses with their city, state, county and country governments. They are finite in number and their contact information is available to the public. There is no secret as to who they are or where they do business. Why would any company doing business in public want to hide from being discovered by potential customers? Sales Reps – Every time you visit a Dive Center, get a card for us and mail them monthly. Dive Stores – Tell us who your Reps are and get a Business Card for us. DIVE LOCAL already has special cooperative programs for Training and Manufacturing Sales Reps to help them identify Retail Dive Centers in their territory. We have gotten business cards from a number of Reps and even listed their accounts on a database that is specifically tailored to them. Their list can be emailed to them quickly and as needed should they lose or forget to bring their Dealer Accounts Book with them on the road. Of course, their list is never available to anyone but them. A great benefit of this program is our automatic updates to the Reps when we discover an out-of-business Dealer or a new Dive Store in their territory. Any Sales Rep can call our office for details and how our program can be of value to them. The last myth I would like to dispel is the fact that any customer and belongs to you. Customers do not belong to you. They are yours only for that period of time when you meet their needs with goods and services they need, want and can afford. If you want them to be your customer for a longer period of time, you must continue to meet their needs. In the 1960’s and 1970’s the major certification agencies published Directories of their Scuba Instructors. The directory listings helped working Instructors find new students. As Instructors stopped teaching classes, the need to be in a directory vanished and actually became a problem with unwanted phone calls asking about new classes. Another problem was that agency competitors may have been using their directory to solicit their Instructors. Either way, the working Professional Educators lost a good source of marketing exposure. Now in the 21st Century we have Instructor and Dealer Directories on-line. It seems that everyone has a directory, but unfortunately many are not well kept or current. And there still is no all-inclusive, industry-wide directory. Maybe with DIVE LOCAL, that will all change. The DIVE LOCAL Website, Facebook Page and Twitter is live. Step 6 – Become a Member of the Dive Industry Association: Becoming a dues paying Member of Dive Industry Association helps fund the projects the association undertakes to promote and help grow the industry. By becoming an Active Member of the association, Dive Industry Professionals are participating in the industry’s growth and success. Without active members that care enough to get involved in their profession, an industry would wither and die. The whole purpose of this Unifying the Diving Industry campaign is to get Dive Industry Professionals engaged in their industry and work with their peers to make this a better place to work and recreate. Think of your annual dues payment and a few hours of your time as a means to promote and grow the industry in a cooperative manner. For critics of the industry, who complain about decreasing sales, loss of our customer base and a decreased interest in scuba diving, let me assure you that this campaign can help breathe new life and vitality into our recreation, hobby, and profession. Steps 1-3 of our campaign focuses on three things that industry professionals could sign up for and observe – for free. Step 4 & 5 focuses on two things that we could do for the cause. A little bit of effort but still no cost. Now in Step 6 we are asking the industry to make an investment of $125 to help fund the marketing tools and technologies the association uses to promote scuba diving and adventure travel to the general public. Purchasing marketing tools, electronic hardware, and software programs to build websites, blogs, press releases, advertisements and marketing campaigns is expensive. If one company had to pay for everything, very little would get accomplished. You can only do limited things on a limited budget. However, if every business in our industry pitched in just a little, imagine what we could do to promote our Members and our trade? That’s the purpose of Dive Industry Association, and as you’ll see in Step 9, the Dive Industry Foundation. Step 7 – Submit 24 Press Release per year for Publication: Press releases are a very important part of uniting the diving industry. There is an inexhaustible need to read information about people, products and places in the diving industry. We all want to know what is happening with diving equipment, diving education and diving travel. That goes equally as well for industry professionals who work in the trade and for divers who scuba dive for the fun of it. As Adventure Seekers and Adventure Travelers we are all natural born story tellers to begin with, whether we realize it or not. I’ve seen dull parties comes to life when someone starts a conversation about diving in some exotic corner of the world. Throw in the words SHARK or LARGE MARINE ANIMALS and you immediately have people’s attention. Why not develop that ability in writing and tell your story to the masses? We can help you with that. The Business of Diving is all about selling what we do, to people who want to do it too. To call it a business, you have to sell something to someone. For a sale to take place, your customer has to become aware of your product, the fact that you sell it and where they can buy it. That’s called marketing. To have a successful business you need to sell a sufficient number of products to a sufficient number of people, and to do that you need to have a marketing vehicle that delivers your message, about your product, to the potential customers that are in the market to purchase it. Advertising is all about telling your customers that you have something for sale that they need, want and can afford. Selling is setting up a mechanism where you can close the sale and allow a transfer of product for compensation take place. A Press Release can therefore be the message that gains the interest that paves the way for a sale. How can press releases unite the industry? Here is just one example. If every one of our Members created 24 press releases per year for publication, more people would subscribe to and read our Weekly News. Growing the number of subscribers puts more people on the same wave length. That is what unifies the industry, more people on the same wave length. The major obstacle is to identify and unify the many different wavelengths in our industry. Our goal is not just to have everyone just read our Weekly News. Our goal is to let the general public know about all the major media sources in our community. That will benefit all of the major media sources and their readers. We’ll do our part to increase the circle of our influence, to benefit the industry. We’ll even help our members get their press releases into other sources of media in our community. Step 8 – Submit 2 Articles about your Company for Publication: Submit two articles about your business, your products or your people to the major print media in the diving industry every year. That may sound like a monumental task, and at this time it probably is. There is no doubt that print media has lost some of it popularity in the digital age. Yet, when we look a little closer we see there are a number of fine magazines that are of interest to the diving community. There are a number of factors we looked at when we compared six diving magazines from our non-profit’s business library. We compared readership and the number of copies printed per month. We felt the overall look and feel of the magazine was important in regards to the quality of the paper, the layout, and the quality of the images. The most important aspect for us is the quality and relevance of the articles and the diversity of topics. All the magazines we looked at covered a diverse range of topics of interest to the diving public. We read articles about diving equipment, dive travel, training, health and fitness, marine life and environmental concerns, local diving, photo techniques and current events. We saw a number of encouraging similarities and we even saw a few topics of interest that are not currently being covered. 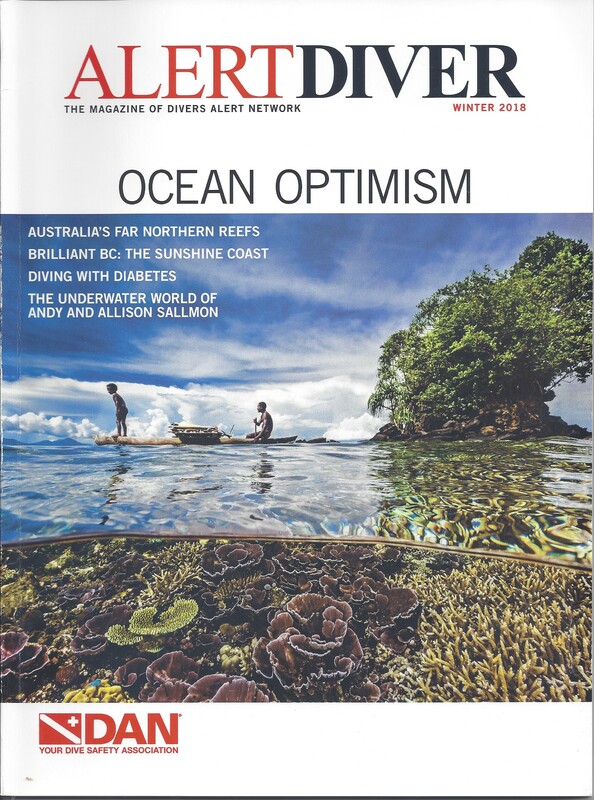 At the top of our list for a quality publication is Alert Diver, The Magazine of Divers Alert Network, published by DAN, Inc. The magazine is a DAN Membership benefit and has an average monthly net press run of 143,949 copies. DAN uses high quality paper, has interesting articles, covers a wide range of topics and has a good balance of advertisements vs articles. I like the fact that Alert Diver had the most pages (112) of the six magazines we compared and the lowest percentage of advertising pages (17.4%) in its Winter 2018 issue. The magazine has good industry support and attracts advertisers from the equipment, training, non-profit and travel sectors. The magazine is laid out very well, doesn’t look cluttered and is easy to read. Alert Diver is our role model and industry standard for future articles on dive industry media publications. Keep up the good work. During our research of different industry media, we did not look at Digital Magazines that did not have a print component to it. This medium and business model needs a comprehensive study to determine its impact on our industry. We did not include digital media in our twelve part series on Uniting the Diving Industry. We also did not look at in-house publications of the certification agencies and have not included them in our white paper on Uniting the Diving Industry. Step 9 – Make a Donation to Dive Industry Foundation: Dive Industry Foundation is a non-profit, tax-exempt, 501(c)(3), charitable organization dedicated to promoting economic development in the worldwide diving community. The Foundation maintains a full time office in Melbourne, Florida. It sponsors DIVE LOCAL, conducts industry surveys, exhibits at diving trade and consumer shows, and conducts business improvement seminars and workshops for dive business owners and their employees. It is establishing a Business Reference Library with books and magazines from the diving industry. The Foundation has sponsored three Regional Summit meetings (Dallas, Chicago, Secaucus) and conducted two industry luncheons in Tacoma, WA. Dive Industry Foundation has held fund raisers to donate money to a Children’s Hospital in Los Angeles and two dive industry families during their time of need. The Foundation has no paid employees and uses only Volunteers. It operates on donations from individuals and businesses. Their web site is www.diveindustry.org and they maintain a Facebook Page and post to Twitter. Donating funds to the Dive Industry Foundation is very important for the growth and survival of the diving industry. Every dive business and industry professional should make it their responsibility to fund this organization that works to research, analyze, advise and promote our industry. The tasks and projects the Dive Industry Foundation takes on are detail oriented, time consuming and non-income generating in the short term. The long-term benefits of having a research, educational, promotional and unifying organization in the industry is priceless. An outside consulting firm can never do what needs to be done in our industry. We must gather and use the collective wisdom, knowledge and experience of Dive Industry Professionals who have had successes and setbacks in their life-long profession. Think of the Dive Industry Foundation as an organizer, mentor and guide that will assist the diving business community in dealing with its own internal strengths, weaknesses, opportunities and threats. I am confident that the dive industry can correct itself. As an organization with its primary goal of “Unify the Diving Industry” the Dive Industry Foundation has accepted the responsibility to define, analyze, advise, unify, promote and increase the economic impact of the diving industry. Working within the parameters of these six steps, I believe the industry will be able to understand the complexities of its makeup, work to end the fragmentation of the market, and increase the opportunities for all industry professionals. Step 10 – Volunteer to work with Dive Industry Foundation or Dive Industry Association. Exhibiting at Trade and Consumer Dive Shows has been a priority of DIA & DIF since their beginning. For a history of shows we have exhibited at, go to diveindustry.org/shows-events/exhibition-history/ We are looking for volunteers to staff our booths at Trade and Consumer Dive Shows. Step 11 – Join Specialty Advisory Groups to stimulate discussions concerning Industry SWOT (Strengths, Weaknesses, Opportunities, & Threats). Another Group is the DIMP – Dive Industry Marketing Professionals. Step 12 – Participate in Future On-Line Webinars and Digital Summit Meetings. The three industry summit meetings that were held in 2016 produced some amount of success but the concept did not have sustainability. It doesn’t make sense to hold annual meetings to complain about the problems of the industry and then do nothing about it. Rather than conduct an in-person summit meeting at trade & consumer dive shows, maybe an ongoing series of short, specifically targeted, digital meetings would be better. The format is simple. Identify the industry’s SWOT (strengths, weaknesses, opportunities & treats) – Suggest potential solutions to the problems – create a plan to pick the best solutions to the problems – Delegate assignments and implement plan – Follow-up. It is also important to record what was suggested, what was implemented and what was accomplished. Having a history of what worked and what didn’t is critical to the following year’s plan of action.